On 1 March 2017, Vanuatu's Justice Minister Ronald Warsal addressed the Human Rights Council bringing the audience to reflect on the current situation in West Papua. The Minister called dignitaries’ attention to the abuses on activists and protesters for the West Papua cause. Mr Warsal requested the intervention of the High Commissioner of Human Rights in order to produce a report on the human rights violations perpetrated by the Indonesian Government on the West Papuan population. Seven Pacific island nations have called for a UN investigation into allegations of human rights abuses in Indonesia's West Papua and Papua provinces, where a separatist movement has simmered for decades. 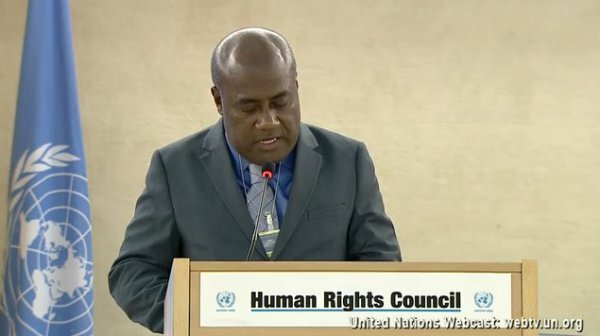 A statement to a session of the UN Human Rights Council in Geneva, read on behalf of the seven states by Vanuatu's Justice Minister Ronald Warsal, accused Indonesia of serious human rights violations of Indigenous Papuans including extrajudicial executions of activists and beatings and fatal shootings of peaceful protesters. The statement called on the council to request a comprehensive report from the high commissioner for human rights and Indonesia's co-operation in providing unfettered access to the two provinces, which independence supporters refer to collectively as West Papua. Pacific island leaders angered Indonesia last year when they used their speeches to the UN General Assembly to criticise Indonesia's rule in West Papua. Jakarta accused them of interfering in Indonesia's sovereignty and supporting groups that carry out armed attacks. Mr Warsal, who spoke on behalf of Vanuatu, Tonga, Palau, Tuvalu, the Marshall Islands, Nauru and the Solomon Islands, said they also wanted to highlight the Indonesian policy of encouraging the migration of Javanese and other ethnic groups, which has led to the dramatic outnumbering of Indigenous Papuans in their own land. The Indonesian government "has not been able to curtail or halt these various and widespread violations," he said. "Neither has that government been able to deliver justice for the victims." Mr Warsal said over the past 15 years the Indonesian Commission on Human Rights had "collected evidence of gross human rights violations by Indonesian security forces in three principal areas of West Papua: Wasior, Wamena, and Paniai". "The Commission has described the sets of cases in the first two places as crimes against humanity, which are punishable under Indonesian and international laws," he said. "In light of these violations and the Indonesian government’s inaction, we call on the UN Human Rights Council to request the High Commissioner for Human Rights to produce a consolidated report on the actual situation in West Papua. "And the report must make recommendations for immediate action to halt the pattern of human rights violations." The Dutch colonisers of the Indonesian archipelago held on to West Papua when Indonesia became independent after World War II. It became part of Indonesia following a UN-supervised referendum in 1969 that involved only a tiny proportion of the population and was criticised as a sham. Independence supporters want a second referendum. The Indigenous people of the two Papua provinces, which make up the western half of the island of New Guinea, are ethnically Melanesian and culturally distinct from the rest of Indonesia, the world's most populous Muslim nation. West Papua is home to the world's largest gold mine by reserves, one of the world's biggest copper mines and vast areas of virgin forest. The government insists it is an indivisible part of the Indonesian state and is unlikely to make any concessions to separatists out of fear that could re-energise other dormant independence movements.